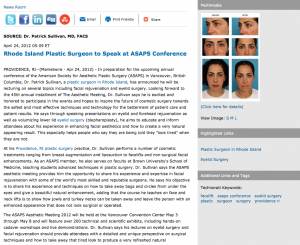 Rhode Island Plastic Surgeon to Speak at ASAPS Conference - Patrick Sullivan, M.D. Providence, RI — In preparation for the upcoming annual conference of the American Society for Aesthetic Plastic Surgery (ASAPS) in Vancouver, British Columbia, Dr. Patrick Sullivan, a plastic surgeon in Rhode Island, has announced he will be lecturing on several topics including facial rejuvenation and eyelid surgery. Looking forward to the 45th annual installment of The Aesthetic Meeting, Dr. Sullivan says he is excited and honored to participate in the events and hopes to inspire the future of cosmetic surgery towards the safest and most effective techniques and technology for the betterment of patient care and patient results. He says through speaking presentations on eyelid and forehead rejuvenation as well as volumizing lower lid eyelid surgery (blepharoplasty), he aims to educate and inform attendees about his experience in enhancing facial aesthetics and how to create a very natural appearing result. This especially helps people who say they are being told they “look tired” when they are not. At his Providence, RI plastic surgery practice, Dr. Sullivan performs a number of cosmetic treatments ranging from breast augmentation and liposuction to facelifts and non-surgical facial enhancements. As an ASAPS member, he also serves on faculty at Brown University’s School of Medicine, teaching students advanced techniques in plastic surgery. Dr. Sullivan says the ASAPS aesthetic meeting provides him the opportunity to share his experience and expertise in facial rejuvenation with some of the world’s most skilled and reputable surgeons. He says his objective is to share his experience and techniques on how to take away bags and circles from under the eyes and give a beautiful natural enhancement, adding that the course he teaches on face and neck lifts is to show how jowls and turkey necks can be taken away, leaving the person with an enhanced appearance that does not look surgical or operated. The ASAPS Aesthetic Meeting 2012 will be held at the Vancouver Convention Center May 3 through May 8 and will feature over 200 technical and scientific exhibits, including hands-on cadaver workshops and live demonstrations. Dr. Sullivan says his lectures on eyelid surgery and facial rejuvenation should provide attendees with a detailed and unique perspective on surgical technique and how to take away that tired look to produce a very refreshed, natural appearance. He says his objective is to help promote the safe practice of cosmetic enhancements and improve the quality of results by furthering the field of aesthetic surgery. Founded in 1967, ASAPS is a collection of plastic surgeons certified by the American Board of Plastic Surgery who specialize in cosmetic plastic surgery. The organization has over 2,600 members spread throughout the U.S., Canada, and other countries across the world. ASAPS sponsors scientific meetings, an official clinical publication called the Aesthetic Surgery Journal, and patient advocacy. To learn more, visit www.surgery.org. Located at 235 Plain Street Suite 502 in Providence, RI, Dr. Sullivan’s practice can be reached at (877) 435-3223. It can also be contacted online via the website drsullivan.com or facebook.com/doctorsullivan.